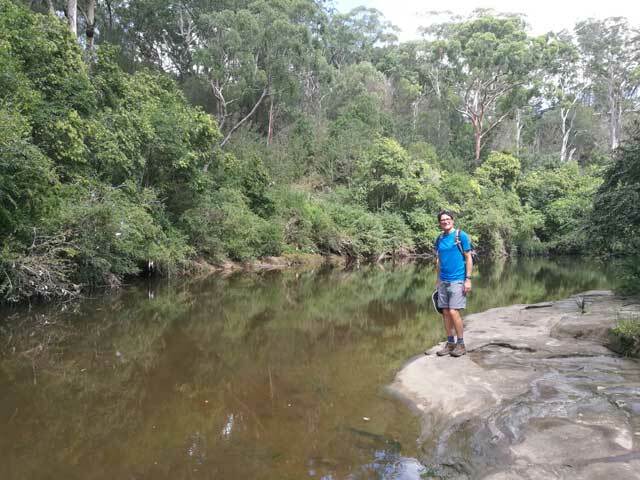 Due to major sewage work in the Blue Gum Reserve, we had to walk to and from Chatswood via the Rail to River Walk. So, the walk became slightly longer at 18km and it was no longer a Figure 8 walk. 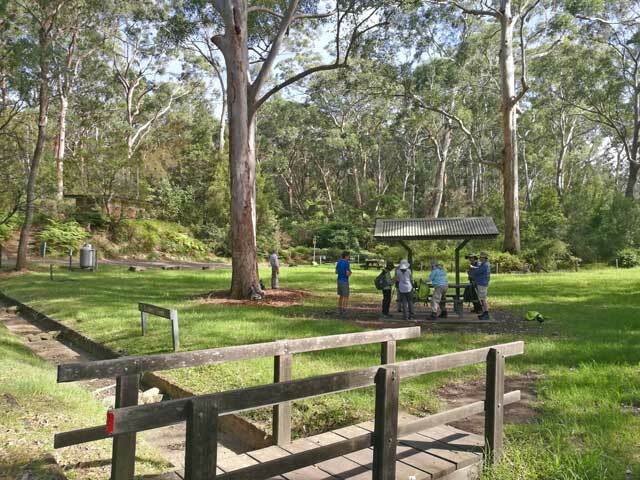 A pleasant walk through the lush and peaceful bushland of the Rail to River Walk along side Chatswood Golf Course brought us to the entrance of Lane Cove National Park near Fullers Bridge. 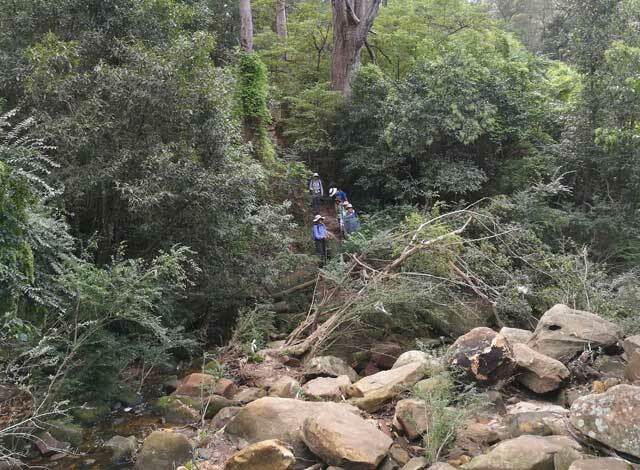 Lane Cove River Park, as it was then known, was opened to the public in 1938, one year before the founding of The Bush Club. 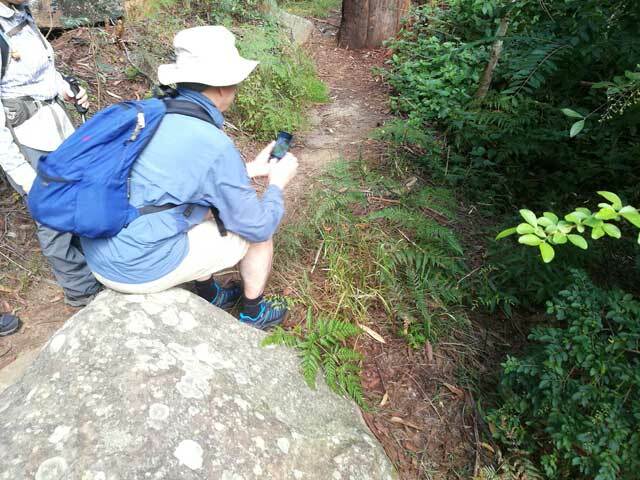 The Park is very popular with outdoor enthusiasts during the weekend but luckily, we had the tracks almost to ourselves on the day of the walk. 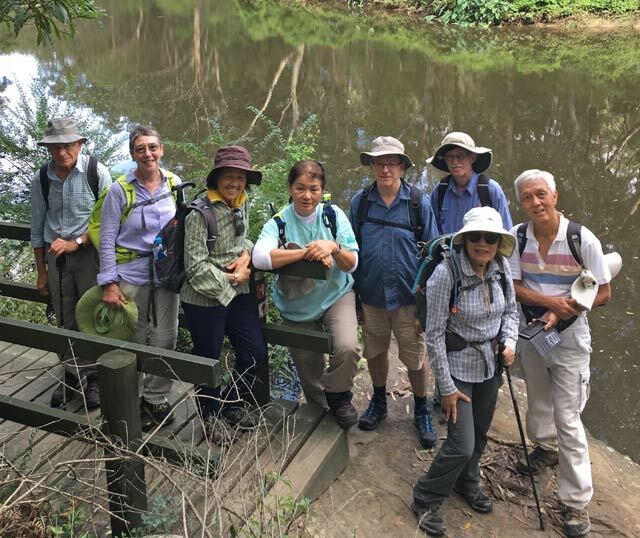 We meandered along the gentle terrain of Riverside Walk until we got to De Burghs Bridge, with a few stops along the way for group photographs. We also saw quite a number of water dragons, ducks and bush turkeys. 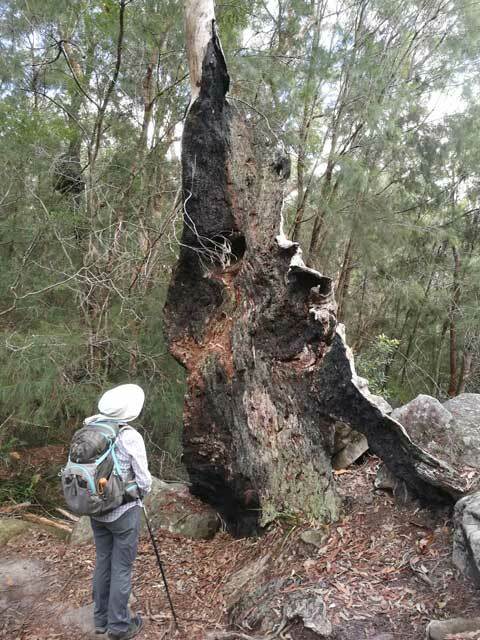 The Great North Walk side of the river was a bit more interesting with beautiful gum trees, rocky outcrops, sandstone overhangs and more undulating terrain. 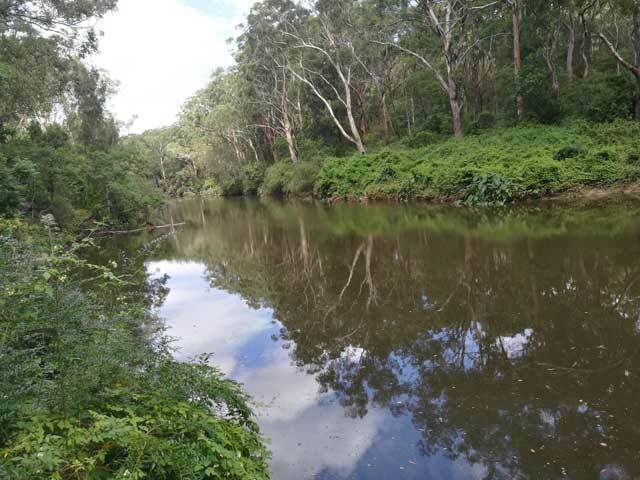 Even though the river looked rather murky, we could still see beautiful reflections of gum trees on its surface. Steven and Charles decided to take a detour down to the Blue Hole for more picture taking. The crossing at De Burgh Creek was almost unrecognizable with all the trees and debris from recent storms but it seemed to make the crossing even easier. 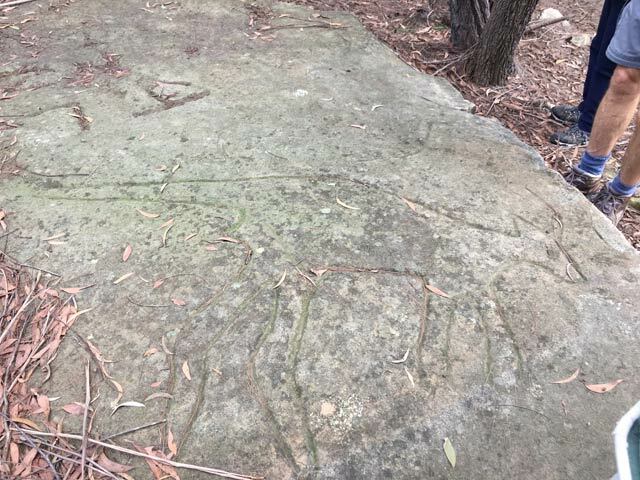 Thanks to Jacqui, we took a slight detour up the fire trail to view the aboriginal carvings. At this stage, the leader was left wondering about the definition of “unhurried pace” as some indicated that the pace was too fast and some indicated it was too slow. One of the prospectives, decided to sign off so he could continue the walk at a faster pace. The rest of the group stopped at a rocky platform for lunch. 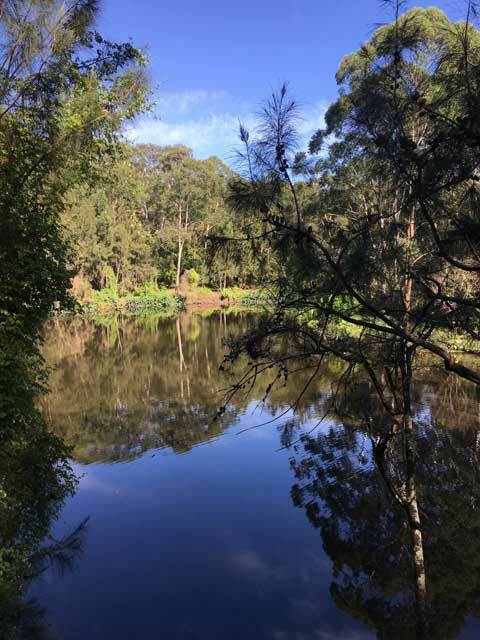 The weather turned out to be rather hot and humid and another coffee break at the café near Lane Cove weir was welcomed. 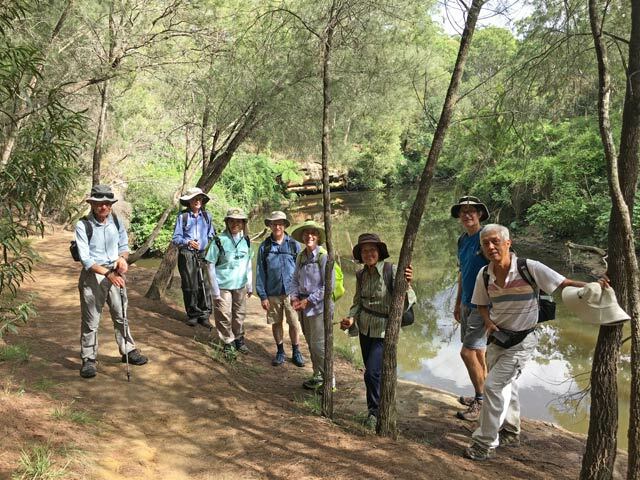 Two more members decided to leave at the bus stop at Fullers Bridge, while the rest retraced our steps uphill to Chatswood via the Rail to River Walk. Congratulations to the prospective, Tony Carolan, who finished his first walk with the Club satisfactorily. Thanks to Steven Sim for taking the pictures.